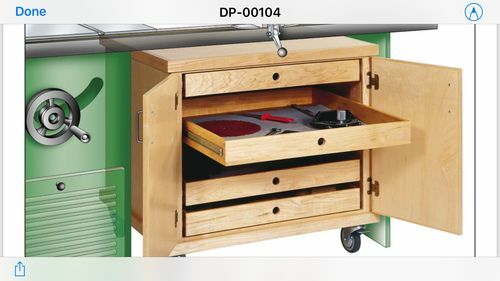 I want to check in and see if any of you guys have storage solutions under the table saw.. I have a Ridgid TS and want to put some kind of cart under the waisted space under the right wing. 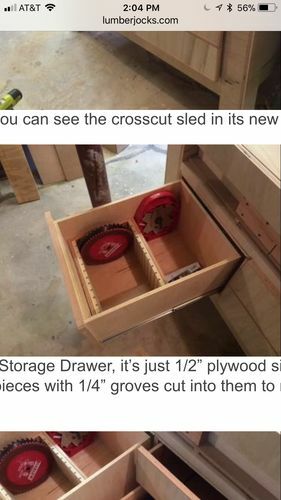 I built one for my saw a few years back…..Go to “My Projects” page and take a look at it….It’s at the bottom of the page, and you can read and see how I built it…...You can modify it to fit your saw…!!! I built one for my saw a few years back…..Go to “My Projects” page and take a look at it….It s at the bottom of the page, and you can read and see how I built it…...You can modify it to fit your saw…!!! The latest edition of Woodsmith has a under-saw cabinet. Their storage solution is a set of vertical pegboard panels that slide out. For me, I might choose a combination of 1-2 panels and drawers. Go back to “My workshop”, look at the clamp rack system, and you’ll see my saw blade holder….And again, a picture of the under saw cabinet…..
Go back to “My workshop”, look at the clamp rack system, and you ll see my saw blade holder….And again, a picture of the under saw cabinet…..
A piece of advice… NOT not make anything like this DO NOT ATTACH it to your saw. Only make a free standing. 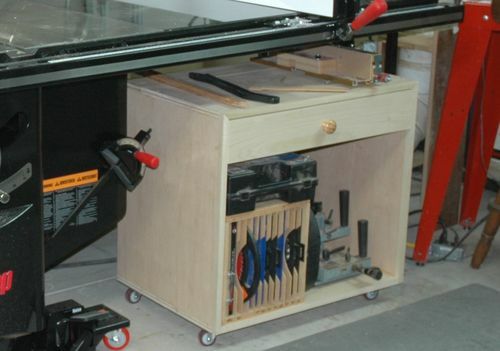 MOST lower end table saws will not support that weight or ANY additional weight. If you try to engage the CASTERS with any kind of extra weight like this it will damage/break/destroy your caster mobile system. I personally have had this issue with my 4512 Ridgid. URGE TO KILL GROWING….. I put on a stack dado blade, a small MDF jig and a 12 once Diet Coke on the saw deck, and its melted down like a nuclear reactor in Fuckashemu! I did this, not nearly as elaborate but does exactly what I wanted.